It’s January 1, 2013 and I’m enjoying the sunshine in our living room. The Christmas tree hasn’t come down yet because none of the needles are falling and my wife wants to hold onto all the Christmas memories for a while yet- our first grandson sitting with us by the tree and the laughter and the Christmas cookies (ok, I’m still eating the Christmas cookies) and the family together. But its quiet in the house and Abby has come to join me on the couch in the sunshine and we are reflecting on the year that’s just been and I’m smiling with the memories. What fabulous stories I get to hear about as couples become engaged! With the permission of some of my clients, I’d like to share some of those stories from 2012. I know you’ll enjoy them too. Do you remember when I shared with you the story about the emerald diamonds, the sweet kiss? We delivered the engagement ring to the young man who wanted to get engaged in Hawaii. Well, his plans changed when he got the ring. 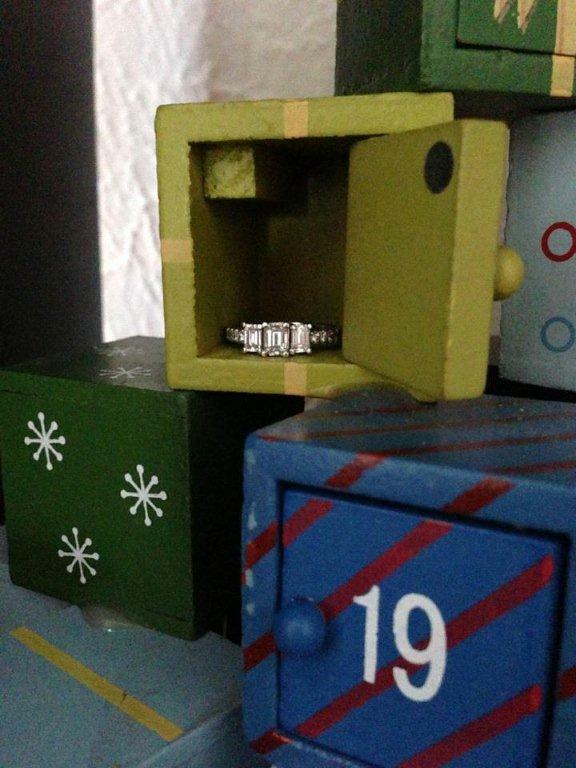 As he and his girlfriend counted down to Christmas using an advent calendar, she opened the door to December 24 only to find her beautiful ring behind the door. I got a text Christmas eve with this picture and the words, “she said yes”. Isn’t that so cool? On boxing day, I got another message. They’ve decided to get married in Hawaii, could they have wedding rings by next week? Well, we met in their living room, surrounded by their dogs to go over the design details. The next day, I worked with my goldsmiths… Their rings will be ready in time for them to get on the plane to Hawaii. We don’t do this often, but sometimes what seems to be impossible can be achieved. So, this young man anticipated coming back from Hawaii next to his fiance. He’ll be coming back with his wife at his side be cause she said yes. This entry was posted in Christmas, Custom design, Engagement rings and tagged Christmas, concierge jewellery service, engagement rings, Oro de Rey, wedding, wedding bands, Winnipeg Jeweller by Gary King. Bookmark the permalink.